Description: Hours of operation are 7:00am-5:00pm, Sunday through Saturday. Check website for Holiday hours. Walk through the town of Kingston and residential neighborhoods on country roads, sidewalks, and trails. Restrooms on the route and at the marina. Pets OK on leash. 5K rated 1A. ESVA: County -Kitsap, County OTSVA: 4E’s (Emergency), 4 B’s (Banks), 4 D’s (Docks). Start Times: Roasters hours are 7:00am-5:00pm. Please walk only during daylight hours, making sure walk ends before dark. Start Point / Driving Directions: 11229 Hwy 104 in Kingston, WA 98246. See Washington State Ferry website (www.wsdot.com) for seasonal schedules. You can drive onto the Edmonds/Kingston ferry and arrive in Kingston in 30 minutes. Exiting off the ferry, you will be directed to the right lane. TURN LEFT onto Ohio Ave NE. Cross over HWY 104. TURN LEFT onto Central Ave NE. Parking is available ahead at the Port of Kingston marina and the Mike Wallace City Park. There are a few free parking spaces, with a two hour limit. To start at Majestic Mountain Coffee Roasters, walk a block to HWY 104 (ferry line and toll booth), and turn left. The Roasters is in the center of the Town of Kingston. Comments: Walk onto the ferry instead of driving. 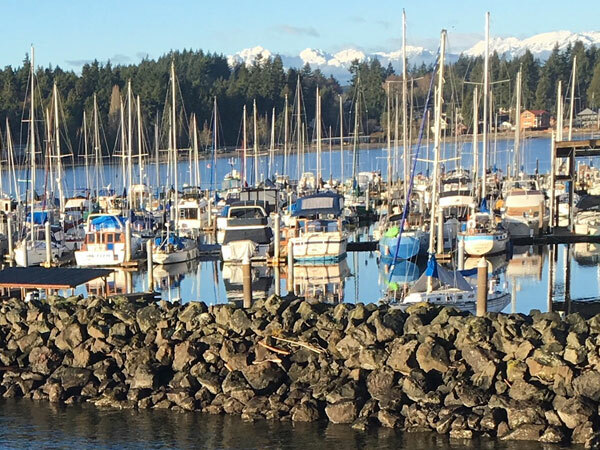 We suggest parking in Edmonds, WA, and walking on the ferry. It’s less expensive, and you pay once on the Edmonds side; no payment necessary on the Kingston side. After landing in Kingston, you’ll walk approximately 1 1/2 blocks, keeping to the left side. The starting point is on the left hand side of Hwy 104.